This is a large house with 5 bedrooms two of which are en-suite. On the ground floor there is a large kitchen with oven, hob and dishwasher and washing machine, a dining room, a lounge, and a downstairs wc. First floor there are three bedrooms and a family bathroom. Third room on the first floor is a smallish double room which has a single bed with a pull out trundle underneath. On the top floor (loft room) there is an en-suite bedroom with two single beds. This has an en-suite with bath tub. It has a sloping roof and is more suited to someone who isn't so tall. The garden is mostly lawn. Please feel free to ask us if you need something that you can't find. There may be bikes available to use if you want to explore the local area - you just need to ask us! Guests will have private use of the main house and garden. We (the owners) have a independent annexe to one side/front of the house and have our own private entrance to the side. We may be there from time to time. Guests enter via the main front door and are completely independent. West Wickham is a lovely area of London and still relatively unknown to tourists. Guests have described it as 'what they expect' of a traditional English town. It's peaceful, the supermarkets and shops are nice and there are plenty of cafe's, restaurants, pubs and parks. Most people say they 'took a chance' coming to an unknown town but all have liked it and have been pleasantly surprised. A few guests even decided to move to the UK and at least 3 separate guests have ended up living in our area. We are on the doorstep of Kent 'the garden of England' with its many stately homes, castles and pretty towns and villages so if you have a car you will be able to visit lots of interesting places in the countryside. Surrey is also close, and you can get to the south coast seaside towns like Brighton in about an hour. West Wickham train station is 6 mins walk away. There are usually 3-4 trains an hour into central London. Trains go to London Bridge, Waterloo East and Charing Cross in 35 - 45 minutes. We are London zone 5. The last train home is around midnight but if you want to stay in London late into the night you can get a train to East Croydon all night long (15 mins journey) and then the N119 night bus (15 mins). The nearest large town is Bromley which is at most 10 mins by car. We have bus stops near our house. East Croydon is also a short bus ride away and has a very large important station from where you can get a train to Gatwick Airport and the South Coast seaside resorts. There are fast trains (15mins) to all London stations from nearby Bromley South which is 8 mins on the bus. Opposite our house there is a park with large area of grass, football pitches and swings, and there is plenty of woodland and nature nearby. Not far away there are golf courses, swimming pool, gym, library and Gambado children's play centre should you get tired of visiting London. Please report any damage, and remember that people live nearby, so no parties or gatherings with people other than those booked! Important to remember is to be quiet on the drive when coming in late at night, not to rev engines early morning or late at night and not to talk loudly on drive (even on phone) or pavement at night or early morning. We are a family and this used to be our home, altough over the years we have travelled and offered the house as holiday lets. It is primarily a home, and our only holiday let property at the moment. We sometimes stay in the independent annexe of the house but if we are away we will leave a contact. Please report any damage, and remember that people live nearby, so no parties or gatherings with people other than those booked! Important to remember is to be quiet on the drive when coming in late at night, not to rev engines early morning or late at night and not to talk loudly on drive (even on phone) or pavement at night or early morning. This is in an ideal London location if you want easy access to the centre, but also want some peace after a long day sightseeing. You will have all the home comforts. It is not a 'hotel' and please remember you won't find luxury, but what we hope is homely, comfortable and spacious rooms. You have everything you need within walking distance, pubs, restaurants, coffee bars, shops, parks, leisure facilities etc so if you choose to spend a day at home you are definitely not isolated. This is a typical English town, where people live and work, and many people commute into London daily from here to work in the city. Lots of choice - visit central London, stay local in a typical English town, or in 5 mins drive be in open picturesque countryside. Good public transport. If you are driving we are 15 mins to the M25, so access to Kent, Surrey and the South Coast is easy. You won't find the heavy smoke and congestion of inner London, and our area is very green, yet with lots of shops, pubs and restaurants. Starbucks, Cafe Nero or lots of independent coffee shops. Each radiator is adjustable, but main thermostat is in the hall by the large colourful picture. Before departure please turn down to 10 as the house may be empty after your visit. Everything you need - dishwasher, hob, oven, fridge freezer, seating at table for 6 comfortably, for larger groups you can use the dining area which is close by and is open plan. Toys available - please ask if you would like toys for a specific age range - we may be able to help, but not guaranteed. Very large garden laid mostly to lawn. This is not a landscaped, manicured garden, but a play garden designed for fun and good for running around or a game of ball or badminton. This will have to be confirmed with dimensions. There is a possibility that the downstairs bedroom might be wheelchair accessible but the en-suite to this bedroom has a step and is too small for wheelchair access. Wheelchair accessible into the main bedroom, but the bathroom has step and the shower has a tray with a lip so access may not be possible. The room is small, so please check measurements with us before booking. We will do our best to accommodate where possible. We had a few family members over from overseas who stayed at this property for a few days during my daughters wedding. Everyone stayed very comfortably and the property was nice and clean. It was also very spacious and well furbished. The landlord was also very helpful throughout. Mr Giri and family were very nice guests - they really looked after the property and left it clean and tidy. We would most definitely welcome them back. I hope they all enjoyed their stay. Safe upscale property close to all conveniences. Comfortable. This house took in all seven (7) of us with two bedrooms to spare. Huge family and living room with a well equipped kitchen. Excellent parking. Convenient connections for trains, tube and travel to Gatwick, Heathrow and Paris. Quiet, private and comfortable. I will like to rent it again in the near future as there is so much we were not able to see in London, Cambridge, Oxford and Paris. 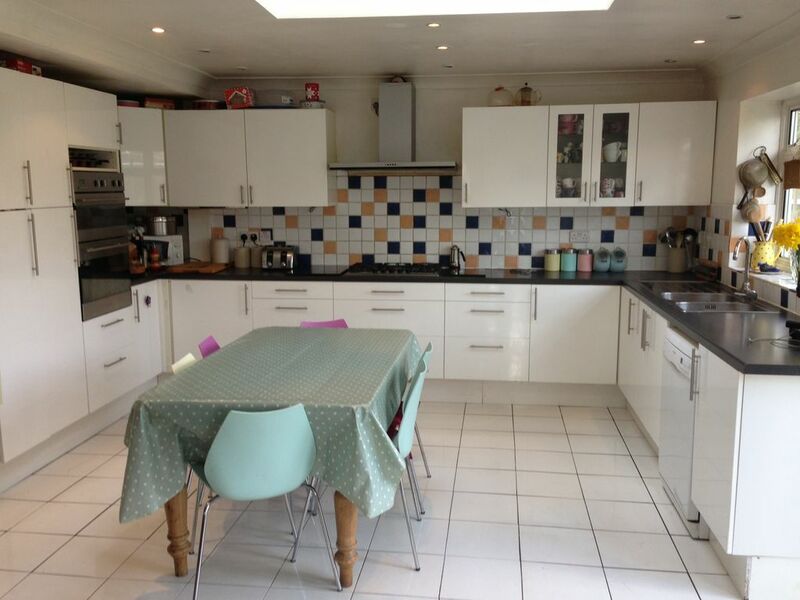 The property is very clean and tidy and welcoming. This is a very good place to spend time with family. The kids enjoyed all the toys available. The owners are very kind and helpful. Ideal large accommodation in good location. Very pleasant hosts with very spacious accommodation. Excellent selection of toys and large garden with plenty of sun. Well served by affordable and convenient public transport. Very suitable for large families. We were 2 adults and five children from 10 - 2. Very happy with accommodation and would happily recommend and return ourselves. We really enjoyed our stay at Wendy & John's place in south London. We were there for a family holiday (adults and children). The children loved that there were toys and a trampoline outside. The patio was great to sit and talk after a day of touring. The bedrooms placed over three floors were comfortable, and allowed privacy for everyone. The train station was a short walk away to provide easy access for London touring (30-35 minute train ride). Any questions we had, Wendy and John were both very helpful. Situated in Greater London 15 min drive from the county of Kent - the garden of England. Central London is 35 mins by train. The West Wickham train goes directly to London Bridge, Waterloo and Charing Cross which is within walking distance of National Gallery, Covent garden, Soho, Big Ben and Buckingham Palace and the West End. West Wickham is about 4 train stops to the DLR for connection to Greenwich and Docklands. The Kent countryside is 15 mins drive. By car visit Leeds Castle, Hever Castle, Chartwell House and Garden where Churchill lived, Downe House and Gardens, Christmas Tree Farm, High Elms Country park and more, also Brighton beach is less than one hour away by car. Locally visit Cinema, Theatre, Swimming, Excellent Golf, Walking in Woods, Gambados and other indoor play areas for children. Several restaurants within 5-10 minute walk - pubs, pizza, award winning English restaurant, Asian, Italian, Turkish and more. Golf: There are several Golf courses nearby although you will need to check if there are available for occasional use. The prestigious Langley Park Golf course backs onto the house and the entrance is less than 3 minute drive away. Beckenham Place Park is public and is 10 min drive. Hever golf and country club is approx 40 min drive. Driving range 10 min drive.There is a pitch and putt course which is good for children and adults, about a 5 minute drive away. No parties or large gatherings allowed. Visitors other than those checked in are not permitted other than a maximum of 5 guests for daytime hours until 9.00pm. The reason for this is that guests often make more noise coming and going than checked in guests and can be very disruptive to neighbours when leaving late.